President Alvaro Uribe:"Production of coca in Colombia rises"
Despite record drug eradication efforts, production of coca in Colombia rose for the third consecutive year in 2006. Uribe, who travels to Washington on Wednesday to secure the continued flow of U.S. anti-drug aid, revealed the findings of the still unreleased report at the end of a long speech Friday. A transcript was posted Sunday on the president's Web site. Uribe said the White House Office of National Drug Control Policy survey, which is based on satellite imagery, found that production rose 8 percent last year, to 156,000 hectares (385,484 acres) an area twice the size of New York City. "Yesterday (for Thursday) they told me they were worried about reveling this number because of my upcoming trip to the United States, that the Americans should reveal it," Uribe said. "But that's why I'm revealing it. We're not trying to put makeup on what is a serious matter." The much-awaited estimate, if confirmed, could revive debate about the effectiveness of Plan Colombia, the U.S.-backed anti-narcotics and counterinsurgency program that has cost American taxpayers more than US$5 billion (EUR3.7 billion) since 2000. 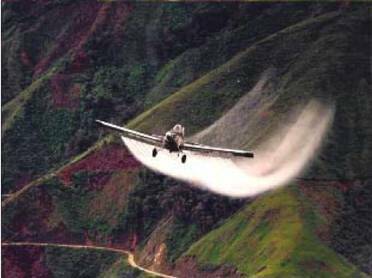 Last year, Colombia's drug police used U.S.-supplied planes to spray glyphosate herbicide on 424,000 acres (171,000 hectares) of coca and opium poppies, and they manually eradicated an additional 42,100 acres (17,000 hectares) of coca. In 2005, authorities fumigated almost 345,900 acres (140,000 hectares). Yet the United States found the amount of coca in 2005 surged 26 percent, to 144,000 hectares (355,831 acres). White House drug czar John Walters argued the unexpected rise was a statistical aberration owing to a near doubling of the area surveyed. Rafael Lemaitre, a spokesman for the White House's Office of National Drug Control Policy, said in an e-mail message Sunday he had not yet seen the coca estimates, whose release was originally expected in April. The inexact science behind the coca estimates has long irritated the Colombian government, and drug policy experts question figures on drug production in densely jungled parts of the country where state presence is almost nonexistent. A soon-to-be released estimate prepared jointly by the United Nations and Colombian authorities found that aerial eradication reduced the country's coca crop by 10 percent last year, to 79,000 hectares (195,000 acres) almost half the U.S. estimate. The data was provided to The Associated Press last month by a source familiar with the data who requested anonymity because the figures are not yet officially released. Uribe said Friday that the varying estimates were "incomprehensible" and "disorienting," and he called on the United Nations and United States to unify their methodology. "We've unleashed a battle with all our will and all our determination," Uribe said. "Could it be we've worked in vain? That all our work hasn't produced the desired results?" He suggested earlier estimates had not included all of Colombia's territory.